From infancy, Tatum had impaired vision.Several explanations for this have been posited, most involving cataracts. He had eye operations, which meant that “when he was eleven he was at least able to see things held close in front of him, and possibly to distinguish colors.” Any benefits from these procedures were reversed, however, when he was assaulted, probably in his early twenties. Accounts vary on whether Tatum’s parents played any musical instruments, but it is likely that he was exposed at an early age to church music, including through the Grace Presbyterian Church that his parents attended. He also began playing the piano from a young age, playing by ear and aided by an excellent memory and sense of pitch. He learned tunes from the radio, records, and by copying piano roll recordings. In an interview as an adult, Tatum rejected the story that his playing style had developed because he had found ways to reproduce piano roll recordings made by two pianists.He developed a very fast playing style, without losing accuracy. As a child he was also very sensitive to the piano’s intonation and insisted it be tuned often. Although piano was the most obvious application of his mental and physical skills, he also had an encyclopedic memory for Major League Baseball statistics. Tatum first attended Jefferson School in Toledo, then moved to the School for the Blind in Columbus, Ohio late in 1924.He was probably there for less than a year before transferring to the Toledo School of Music. He had formal piano lessons with Overton G. Rainey at either the Jefferson School or the Toledo School of Music. Rainey, who was also visually impaired, probably taught the classical tradition, as he did not improvise and discouraged his students from playing jazz. By the time Tatum was a teenager, he was asked to play at various social events. Tatum drew inspiration from the pianists James P. Johnson and Fats Waller, who exemplified the stride piano style, and from the more modern Earl Hines, six years Tatum’s senior. Tatum identified Waller as his biggest influence, but according to pianist Teddy Wilson and saxophonist Eddie Barefield his favorite jazz pianist was Hines. He bought and listened to records by Hines and practiced improvising with them. In 1927, Tatum began playing on Toledo radio station WSPD as ‘Arthur Tatum, Toledo’s Blind Pianist’, during interludes in Ellen Kay’s shopping chat program and soon had his own program. During 1928–29, his radio program was re-broadcast nationwide. Lester summarized Tatum’s abilities and effect on others even from near the start of the pianist’s career: “his accomplishment, even at an early age, was of a different order from what most people, from what even musicians, had ever heard. It made musicians reconsider their definitions of excellence, of what was possible.” As word of Tatum spread, national performers passing through Toledo, including Duke Ellington, Louis Armstrong, Joe Turner, and Fletcher Henderson dropped in to hear him play. In 1932, vocalist Adelaide Hall was touring the United States with two pianists. After arriving in Toledo, she heard Tatum play, and recruited him.This provided him with the opportunity to go to New York, which many other musicians had encouraged him to do, as it was the centre of the jazz world at that time. On August 5 that year, Hall and her band recorded two sides (“I’ll Never Be the Same” and “Strange as It Seems”); these were Tatum’s first recordings. Two more sides with Hall followed five days later, as did a solo piano test-pressing of “Tea for Two” that was not released for several decades. Tatum’s only known child, Orlando, was born when Tatum was twenty-four. The mother was Marnette Jackson, a waitress in Toledo. It is likely that neither had a major role in raising Orlando, who pursued a military career and died in the 1980s. After his arrival in New York, Tatum participated in a cutting contest at Morgan’s bar in Harlem, with the established stride piano masters – Johnson, Waller, and Willie “The Lion” Smith. 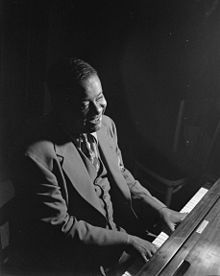 Standard contest pieces included Johnson’s “Harlem Strut” and “Carolina Shout” and Waller’s “Handful of Keys”.Tatum played his arrangements of “Tea for Two” and “Tiger Rag“. Reminiscing about Tatum’s debut, Johnson said, “When Tatum played ‘Tea for Two’ that night I guess that was the first time I ever heard it really played. 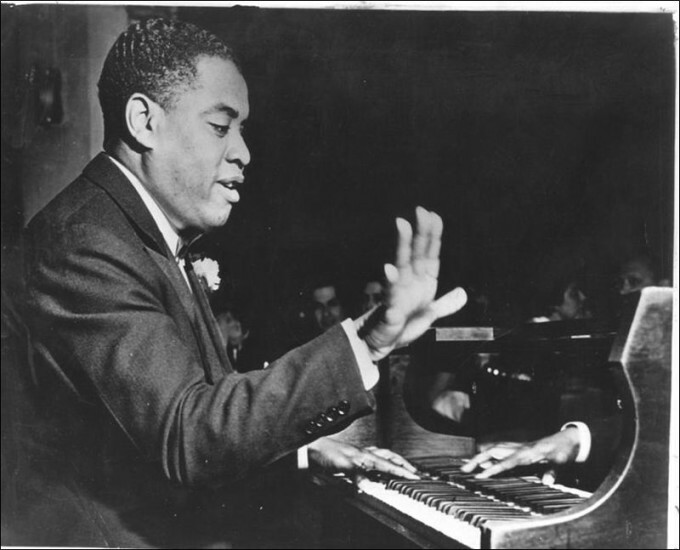 Tatum’s first solo piano job in New York was at the Onyx Club.He played a mix of ragtime, one-step, and standard pieces, plus stride and snatches of classical music. He recorded his first four solo sides, for Brunswick Records, in March 1933: “St. Louis Blues“, “Sophisticated Lady“, “Tea for Two”, and “Tiger Rag”. During the hard economic times of 1934 and 1935, Tatum mostly played in clubs in Colorado, but also recorded in New York four times in 1934 and once in the following year. He also appeared on national radio, including for the Fleischman Hour broadcast hosted by Rudy Valleein 1935. In August of the same year, he married Ruby Arnold, who was from Cleveland. He began a residence at the Three Deuces in Chicago the following month, initially as a soloist and then in a quartet of alto saxophone, guitar and drums. At some point that year, Tatum also accompanied a teenaged Jon Hendricks at the Waiters’ and Bellmens’ Club in Toldeo. He recorded in Los Angeles for the first time early in 1937 – four tracks as the sextet named Art Tatum and His Swingsters. Continuing to travel by long-distance train, Tatum settled into a pattern of “frequent appearances at well-known jazz clubs in New York, Chicago, and Los Angeles, usually on a double bill with a jazz combo, and between these he would fill in with jobs at lesser-known, often obscure clubs where one would hardly expect to hear a performer of such stature.” Thus, in 1937 he left Los Angeles for another residence at the Three Deuces in Chicago, and then went on to the Famous Door club in New York. He recorded for Brunswick again near the end of that year. In March the following year, Tatum and his wife embarked on the Queen Mary for England. He performed there for three months, and enjoyed the quiet listeners who, unlike some American audiences, did not talk over his playing. Four of his very limited number of compositions were also published in England. He then returned to the Three Deuces.The overseas trip appeared to have boosted his reputation, particularly with the white public, and he was able to have club residences in New York over the following five years, sometimes with stipulations that no food or drink would be served while he was playing. Tatum recorded 16 tracks in August 1938, but they were not released for at least a decade.A similar thing happened the following year: of the 18 sides he recorded, only two were issued as 78s. A possible explanation is that big band music and vocalists were popular, so very few jazz pianists made solo recordings, and there was a very limited market for them. He was, though, able to make an adequate living from his club performances. One recording from early in 1941, however, was commercially successful, with sales of perhaps 500,000.This was “Wee Baby Blues”, performed by a sextet and with the addition of Big Joe Turner on vocals. Most of that year was spent in the eastern United States; in contrast, he was back in California for much of 1942. In 1943, Tatum won Esquire magazine’s first jazz popularity poll. Perhaps believing there was a limited audience for solo piano, he was inspired by Nat King Cole’s successful jazz trio to form his own trio in 1943 with guitarist Tiny Grimes and bassist Slam Stewart, whose perfect pitch enabled him to follow Tatum’s excursions. Tatum recorded exclusively with the trio for almost two years. Grimes abandoned the group, but Tatum continually returned to this format. He also carried on his solo work. Although Tatum was admired by many jazz musicians, his popularity faded in the mid to late 1940s with the advent of bebop – a movement that Tatum did not embrace. Despite the decline in fame, Tatum went on to perform a jazz concert at the Metropolitan Opera House in 1944 alongside other popular jazz artists such as Louis Armstrong. Tatum and Ruby divorced in the early 1950s. They probably did not travel much together and she had become an alcoholic; the divorce was acrimonious. In the last two years of his life, Tatum regularly played at Baker’s Keyboard Lounge in Detroit, including his final public performance in April 1956. Earlier, Tatum had selected and purchased for Clarence Baker the Steinway piano at Baker’s, finding it in a New York showroom and shipping it to Detroit.